"The friend" explores the long and storied relationship between friendship and the traditional family of the church in England. Bray evaluates how the ethics of friendship have evolved over the centuries from ideas of moral benevolence to a more private and sexualized idea of friendship. "Medievalists should read this book for its content, its method, and its revisionary view of a Middle Ages extending . . . . far beyond the Lockean 'civil society' that supposedly buried it. . . . 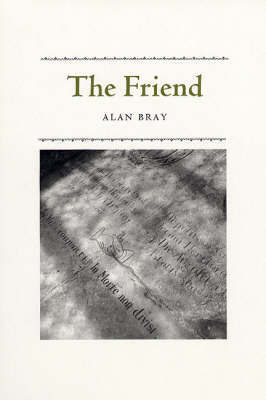 The Friend is beautifully and engagingly written: the reader is treated as peer and confidant, embarked on a rather eccentric but wholly absorbing itinerary of church combing and tomb peering. --David Wallace "Speculum ""
"The Friend is a complex, multi-layered book that transports the reader through five or six centuries of religious rituals, tomb markers, letters between friends, manuscripts, and historical events. . . .It is also like a detective story in which the author and reader explore together thje mysteries hidden beneath and behind the tombstones and brass plaques. . . . But have no mistake this is a scholarly work with some important insights about the meaning of friendship in English culture." --Peter M. Nardi "Journal of Homosexuality ""